Break out the tissues. July is almost here, meaning it's almost time to say goodbye to this year's leavers! *Studio audience goes "AWWW! "* As usual, this year's Leavers' Party will take place on Oshima Island in the beautiful Kesennuma Bay. You'll be roughing it in some sweet tents (no set-up required!) while sipping on some Tome juice (at your own peril.) Walk around the island to take in some nice views, go down to the beach for a swim, play some ball, or anything else you'd like to do on a camping trip! Whether you're leaving or staying, come and enjoy some camp site shenanigans and delicious food and drink to end the year with your fellow JETs!! 6000 yen per person. 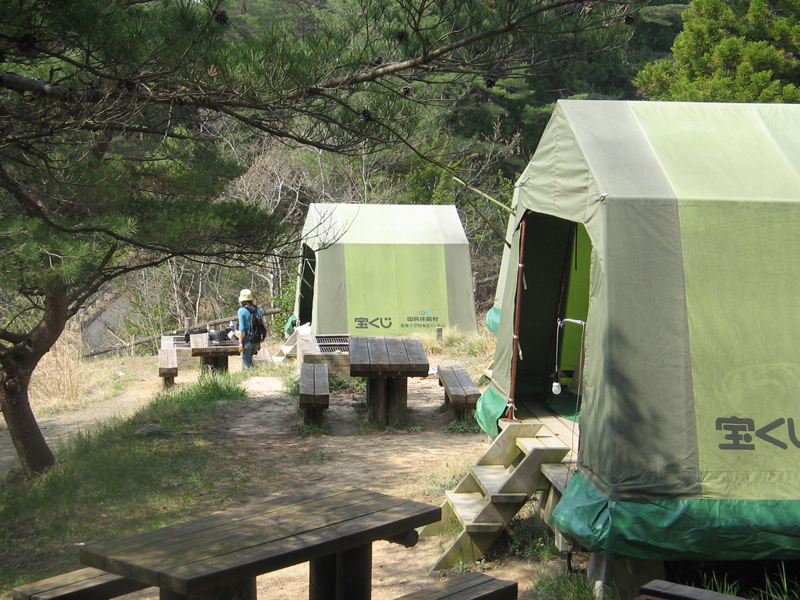 This covers dinner (yakiniku and seafood assortment prepared by us over fire), your stay in a wonderful weatherproof tent (remember to bug spray yourself, though! ), and breakfast the following day (buffet style). Make sure to sign up by Friday, June 29 using the Google Docs form link at the bottom of this page. Joining the Facebook event page does not count as RSVPing! Dinner includes a yakiniku and seafood package, which we cook by ourselves; breakfast is buffet style. 4 people to a tent. Two blankets and a urethane mat are provided for each person. Tents are weatherproof and on elevated platforms, so do not worry about waking up in a puddle should the tsuyu attack. The Leavers' Party is BYOB, so you have the freedom to decide how you will be intoxicated! Bring something for yourself and/or something to share. Dinner and breakfast are included in the 6000 yen participation fee, but feel free to bring extra calories. Musical instruments (banjos and balalaikas welcome), cardboard games, soccer balls/footballs, whatever (appropriate) forms of entertainment your heart desires! To protect yourself from the beasts of the wild. There is a beach a short walk away from the campsite. On the campsite can be found here. The island of Oshima is located in Kesennuma, about 3 hours north of Sendai and has a population of approximately 3,400 (spread out over its 9 sq. km). 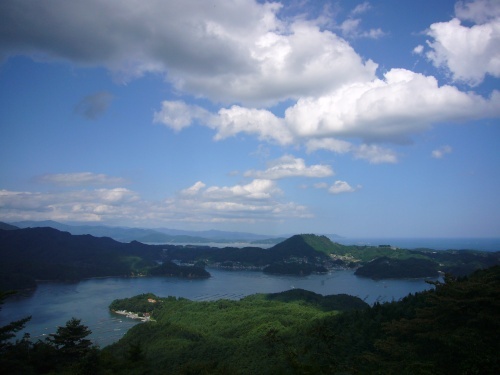 Kameyama, with a summit of 235 m above sea level, offers a beautiful view of the surrounding area, and Kugunarihama beach is also within walking distance from the campsite, so get your hiking shoes and swimming gear ready! Since Oshima is a good 3-hour drive to the north of Sendai, we will be arranging carpools! Please make sure to indicate on the sign-up form if you are a kind-hearted soul who would be willing to bring additional passengers in your vehicle, or alternatively, if you are in need of a ride. As an enticing side note, drivers will receive 500 yen per each extra person they bring in their cars! Although there is a car ferry that can carry you and your vehicle to Oshima, it is recommended that you leave your car in one of the parking lots near the Kesennuma ferry port. There is a free parking lot right next to the ferry port, and a few other lots which are all a 15 to 25-minute walk away from the port. Once you have arrived at the port (and secured a parking spot for yourself, if applicable) it is an enjoyable 25-minute ferry ride over to Oshima Island (410 yen one-way), then about a 5-minute bus ride to the campsite. You can find a detailed ferry schedule here. Please click the link and fill out the form below by Friday, June 29 to sign up for the 2018 Oshima Leavers Party - this is the only official way to sign up (Facebook event responses do not count as officially RSVPing)! Please make sure that you do not have any work obligations this weekend! If you cancel after June 16th, you will incur all costs. Click Here for the Sign-Up Form! !